Sinuses are hollow spaces, cavity commonly found within the bones or other tissue between your eyes, in the forehead and behind the cheekbone. Sinuses produce mucus that helps to protect you against dust, pollutants and allergens by keeping nose moist from inside. In most of the cases sinus infection starts with cold or fever, caused by a virus. In such cases nasal tissues swell and membrane of the sinus cavity get inflamed that blocks the passage that normally drain sinuses. People who have some kind of allergies are also prone to sinusitis. People who have a history of chronic sinus infection should take preventive measures.to save them from cold and flu. Using humidifier, cleaning nose everyday properly can also help to save you sinus problem and reduce the chances of future occurrence of sinusitis. Using saline water to flus the mucous out will also be helpful. You can also cure sinusitis with home remedies “see the details”. Over the counter and prescription of nasal sprays can give relief in sinus problem. 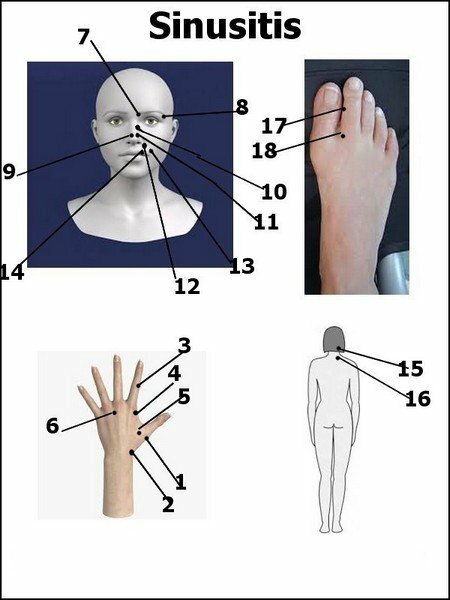 Home remedies and treatment to cure sinusitis with acupressure is quite effective and safe.. Acu-points are given below to cure the sinusitis. All these points are by-focal that means both side of the body. If you are suffering from any chronic disease, long-standing illness or from a disorder involving tissue change or degeneration, you should not do acu-point stimulation. Pressure should also not be applies on acu-points before or after 1/2 hour of taking hot water bath or taking your meal.